Fall semester begins tomorrow at Iowa State. I am back in Ames for my last year, 5th year in the architecture program in the College of Design. I am looking forward to being back after spending the spring in Rome for study abroad and the summer in Cedar Rapids interning at OPN. My internship experience this summer gave me a wealth of new perspective on my career in architecture or whatever it may come to be. This was possibly the last summer I’ll be living in Cedar Rapids, or perhaps just the last summer I’ll be living at my parent’s house. I am constantly begging the question whether bigger and better things are really out there, elsewhere, other than here; or is bigger and better simply what I make of where I already am. I honestly believe the answer could be either but have yet to come to a conclusion without experiencing more first. Of course a career in just about any profession is not static and it is not odd to change what you are doing a number of times throughout your life. Regardless, where ever I end up, I want to be in a place where I can be rooted to my community and truly be engaged and belong. This seems a difficult notion, alongside the prospect of an uncertain future, which is both exciting and a bit disappointing at the same time. I have always been a planner, despite often poor execution of them – at least in the short term. For long I have attempted to figure out where and what I intended to be doing in the future. It is perhaps comforting, but more so, it is something to look forward to. However, trying to plan your whole life out in bullet points can be demoralizing once you get past a couple of years, and particularly in the old age years, as nearly every aspect of life (family, friends, relationships) that gives people lifelong joy is, to a large extent, yet to be determined or discovered. Certain expectations about life also muddle this planning and require constant modifications to ones’ plan. Companionship, particularly, cannot be blindly written into a five or ten year plan. Aside from these more serious matters, there is no problem to have specific dreams and desires, but an understanding and acceptance of them changing is a necessary accompaniment. My ideas of what I’d be doing beyond college has changed almost annually ever since high school, and to every change, I have found them to be good and generally more refining. Perhaps this is not so unusual and I am just more aware to analyze my ambitions than most. The idea of career development and goals has always made me uneasy, especially as I get closer to that stage in my “career.” I consider my personal and professional goals essentially one in the same. As an architect, it seems, they would almost have to be. Architects should be invested in their place (community) with a desire to serve and contribute just as they would as citizens, otherwise they are just working to work and might as well be the ubiquitous business person with an anonymous job. So with that I am looking forward to my last year as an undergrad, and am becoming much more accepting and comfortable with not knowing exactly where the future will take me. I have new tendencies of where I might like to start out but I am learning that the outcome, and more importantly the journey of “career development” will be much more beneficial if I keep an open mind and resist my innate impulse to make a decision before one is needed or even plausible. I value the experience and insight I have gained from my experiences working, living and exploring in all the places I have. Cedar Rapids, Fargo, Ames, and Rome are all places I have called home and each one I appreciate for the things I have learned there and the impressions they’ve made on my character. They have shaped my perception of community and urbanism and provided a benchmark to move forward from and discover or create something bigger and better. Regarding my blog, which has developed into a largely Cedar Rapids-focused report on urbanism and transit development, I’d like to get back to a more analytical approach. Over the course of my blog, I have written a number of key posts that tend to be more in-depth and thoughtful writings that concern a greater idea or expression beyond the subjects alone. As I get back into the school year and my posting frequency inevitably goes down, it seems an appropriate time to accept this change and look forward to a bit less content, but much more substance. Urban Thinking has a new look. I created this new design to better reflect my own aesthetic approach and give Urban Thinking more of an identity and a visual branding. I also intend to use this site to publish and communicate my architecture studio work, as well as other the projects. At the moment, however, the portfolio page is still under development. An enormous thank you goes out to Michael Dorman, who meticulously coded the entire new theme according to my visual specifications. Let me know what you think. 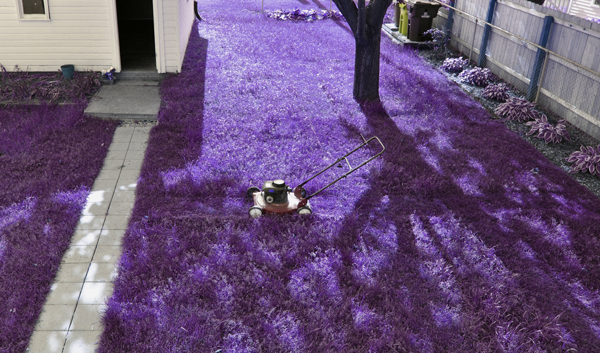 Ever wonder what it’d be like if the grass was purple instead of green? Well I have; the thought often comes to mind when doing yard work. I decided to take a photo while mowing the lawn today to compliment a witty “Living the Dream” post, but decided to change focus after playing with the hue adjuster in Photoshop. Happy New Year. Urban Thinking went online in January 2007, and I’ve been blogging for three years now. 2009 saw around 3000 visitors and 72 posts, a 160% increase from 2008. 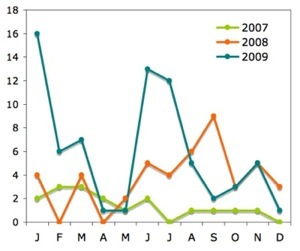 The graph below shows posts by month for the past three years. Posting is typically higher in the summer and goes down during the school year. Somewhat inevitably the 2008 flood has driven a heavy focus on Cedar Rapids. An increase in CR posts since the flood has paralleled my own increase in civic involvement. Specific topics I have blogged about often include the Veterans Memorial Building / City Hall (which I worked at for three summers including the flood), various planning meetings and open houses, and of course CR Transit. Listed below are my top five posts from 2009, that I feel were the most substantial and garnered the most response. I took a leisurely bike ride – about 20 or so blocks – to Noelridge Park tonight. I have never really considered Noelridge to be close to my house growing up and certainly wouldn’t call it a park serving my neighborhood, but the way there was pleasant and did not take long at all. It just goes to show that having a connecting grid of residential streets and more bike-friendly thoroughfares makes everything seem much closer together and accessible on a bike. Think of all the little trips that, by default, we just drive to when we could bike (or walk if close enough) to instead without taking a lot of additional time. Of course, it’s all relative to the type of street environment and how contiguous neighborhoods are. Recreational cycling is a good way to discover biking can also be a legitimate means of getting around. Two University of Iowa students have started a late night bike-taxi service in downtown Iowa City. “ic Ecocabs” provides service only to the immediate blocks around downtown – avoiding some very steep hills west of the Iowa River. A very cool idea that adds even more diversify of transportation in this eco-minded college town. See photos and more from The Daily Iowan. On Friday I bought a used 1981 Fuji S12-S road bike from a thrift store in Waterloo that my friend Robby spotted. I was able to determine the production year with the serial number thanks to ClassicFuji.com. The site has a great deal of information on the history of Fuji bicycles between 1971 and 1991. The catalog page for my exact model can be seen here. Judging from this, pretty much everything on my bicycle appears to be original. Despite some aesthetic blemishes and rust speckles, the bike functions extraordinarily well and is a much easier ride than my mountain bike – as expected. I’ve been wanting to get a road bike for some time now, after getting tired of riding my heavy, fat-tired mountain bike up inclines during the school year when I bike primarily for utility (transportation) and not for recreation. I’m pleased to now have two choices – a road bike for getting around town and on campus – and a mountain bike for off-road recreation and for snow and ice as needed in winter. 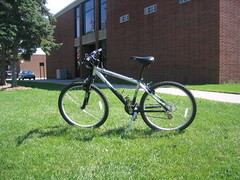 My mountain bike (photo left) is a 2005 Raleigh Mojave 2.0, that I purchased new at the beginning of my freshman year of college from Island Park Cycles in Fargo, North Dakota. While I think the right-wing talking heads’ idea to boycott GM and Chrysler in hopes of “making Obama fail” is futile and pathetic, I have little sympathy for these companies. Choosing to ride the wave of America’s SUV craze instead of developing more alternative fuel and efficient vehicles earlier, was not only ignorant, but irresponsible to thousands of US auto workers and supporting industries. In the meantime, foreign competitors like Toyota and Honda have gained significant market share as they’ve been producing economical, efficient vehicles for years while American automakers were dragging their feet. Gee, I wonder why they are doing so badly now? Oh, and we can’t forget about this either, GM. 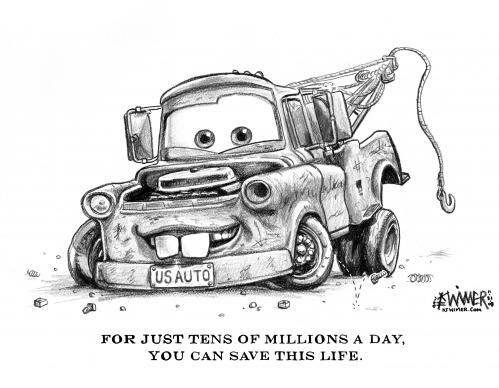 Instead of buying a new car from GM or Chrysler to “help out,” or not buying one to “hurt” them, Americans should buy the car that works best for them – which could very well be Toyota, Honda, or so on. Even better, buy a bike or take public transit. For the record I will not be buying a car, American or not, anytime soon.